534 pages | 69 Color Illus. The best decisions made by public managers are based not on instinct, but on an informed understanding of what’s happening on the ground. Policy may be directed by ideology, but it must also be founded on reality. The challenge of making the right decisions as a public manager is often, therefore, based on the need for rigorous, actionable research. 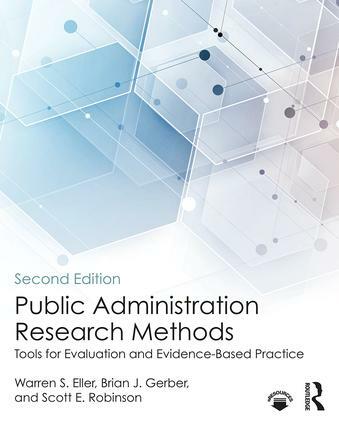 Now in a thoughtfully revised second edition, this textbook shows students of Public Administration exactly how to use both qualitative and quantitative research techniques to give them the best chance to make the right decisions. To better orient the student, the second edition is thematically arranged. Five sections, each with a short essay, provide not only previews of the content of each section, but more importantly guide the reader through how the concepts and techniques covered relate to real-world use and application. A new chapter on applied quantitative analyses has been added to offer coverage of several commonly-used and valuable analytic techniques for decision making for policy and management: benefit-cost analysis, risk assessment, and forecasting. The second edition is accompanied by online materials containing suggested course plans and sample syllabi, PowerPoint lecture slides, and student support materials to illustrate the application of key concepts and analytic techniques. Each chapter also includes discussion questions, class exercises, end of chapter review questions, and key vocabulary to provide students with a range of further tools to apply research principles to practical situations. 1. Introduction: What is Research? Warren S. Eller is Associate Professor in the Department of Health Policy, Management, and Leadership in the School of Public Health at West Virginia University, USA. Brian J. Gerber is Associate Professor and Director of the Emergency Management and Homeland Security program at Arizona State University, USA. Scott E. Robinson is Bellmon Chair of Public Service and Professor of Political Science in the Department of Political Science and the University of Oklahoma, USA.